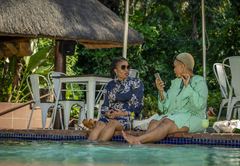 Sefapane Lodge & Safaris is a 3 star graded game lodge offering Phalaborwa accommodation for tourists and visitors of the Valley of the Olifants. 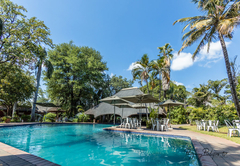 Sefapane Lodge & Safaris is situated next to the Kruger park in the town called Phalaborwa, in the Limpopo province. 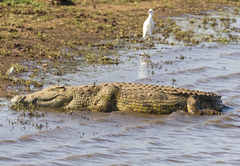 Sefapane is situated only 1 km from the Phalaborwa Gate, the central gate to the Kruger National Park. 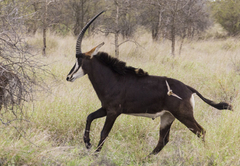 The lodge is on a beautiful parcel of unspoiled bushveld, with dense and abundant gardens and 4 dams. It has an ‘African style’ combined with luxury, which gives you a home away from home feeling as well as a great ‘bush’ experience. 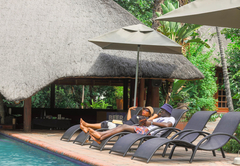 The 4-star luxury lodge consists of 31 fully serviced, traditional ‘African style’ thatched rondavels. 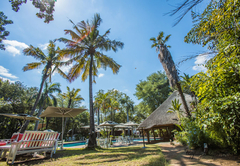 The rondavels, situated under shady trees, are fitted with air-conditioning and en-suite bathroom. We also have 20 excellent safari houses which have a spacious lounge with satellite TV, fully equipped open plan kitchen, 2 bedrooms with en-suite bathroom, guest bathroom, a loft with 3rd bedroom and a private wooden deck and is 160m². 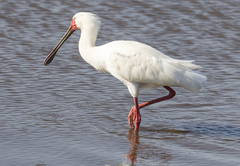 The houses are situated around the dam, where there is brilliant birdlife. 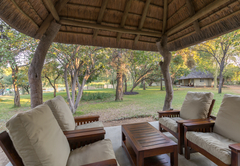 The safari houses are suitable for 6 to 8 persons, self catering, but also able to use all the lodge facilities. Next to one of our two splendid swimming pool is a sunken bar. The restaurant, with open kitchen, serves breakfasts, lunches and divine à la carte dinners. The kids lounge and our special kids program offers a place for the children to have fun, watch television, and play games. Our Spa will also give you an excellent relaxing experience. Besides that there is internet available, a laundry facility, safe parking, bar fridges, braais to rent, 24/7 reception and security. There is also a conference centre and we have a wedding venue. 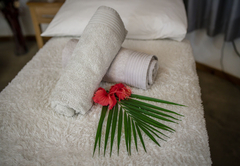 Named after the local Tsonga word for Earth, our spa offers you numerous holistic body and beauty treatments. Set in a real African rondavel or in our lush gardens and using local products featuring South African plants and herbs. Enter a world where time seems to stand still, a place where you are able to pamper and nurture your body and refresh your soul. Our Spa allows you to relax completely, rejuvenating your senses with our thoughtful attention to detail. Enjoy the ancient rhythms of nature, re-discover harmony and balance, forget your daily burdens and find new vitality and a zest for life. Welcome to Misava Spa! 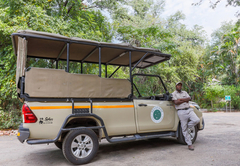 Sefapane Lodge & Safaris organizes safaris within the Kruger National Park guided by experienced FGASA qualified guides and in special designed game viewing safari vehicles. 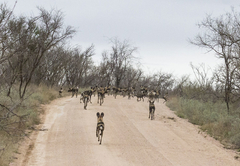 The morning, day and evening safaris as well as the evening bush braais in the Kruger park, river safaris, bush walks and mountain-bike tours are all conducted under the guidance of experienced rangers. 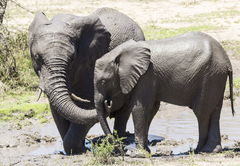 We have day excursions to the Blyde River Canyon, an animal rehab centre and a cultural village tour. Book into one of our 30 Rondavels, set within our sprawling tropical gardens overlooking the 3 natural dams. Our Rondavels are styled in an African theme and accessed via pathways running throughout the lodge. A small porch; Private parking for one vehicle close to your Rondavel. Twin or double beds (with duvets). Mosquito nets, En-suite bathroom, Kitchenette with a small fridge and tea/coffee making facility. Radio/ Alarm Clock, Hairdryer, Air-conditioning, Flat-screen TV with DSTV bouquet. Free Wi-Fi. Book into one of our 30 Rondavels, set within our sprawling tropical gardens overlooking the 3 natural dams. 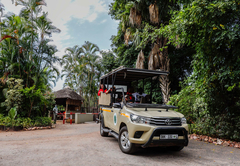 Our Rondavels are styled in an African theme and accessed via pathways running throughout the lodge. A small porch Private parking for one vehicle close to your Rondavel. Twin or double beds (with duvets). Mosquito nets, En-suite bathroom, Kitchenette with a small fridge and tea/coffee making facility. Radio/ Alarm Clock, Hairdryer, Air-conditioning, Flat-screen TV with DSTV bouquet. Free Wi-Fi. A small porch Private parking for one vehicle close to your Rondavel Twin or double beds (with duvets) Mosquito nets En-suite bathroom Kitchenette with a small fridge and tea/coffee making facility Radio/ Alarm Clock Hairdryer Air-conditioning Flat-screen TV with DSTV bouquet Free Wi-Fi. 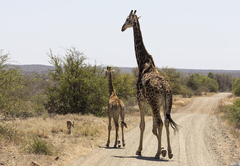 Enjoy the freedom of living in one of our 20 fully equipped self-catering Safari Houses. 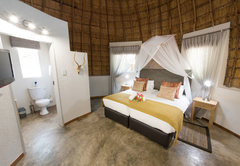 Safari Houses are individually decorated, each offering a unique style, and accommodate up to 8 guests. Nestled on the banks of our dams with wrap around verandas a Safari House offers you prime viewing of the prolific birdlife that have made Sefapane Lodge their home and easy access to the gardens. 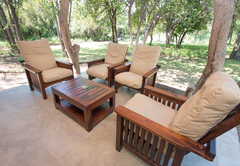 Each house is fully furnished and depending on the house, can accommodate up to 8 guests in true relaxed safari style. 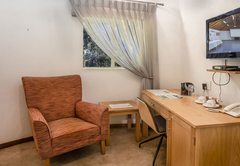 A spacious lounge Television with DSTV bouquet Free Wi-Fi Direct dial telephone Hairdryers Individual safe in the main bedrooms Radio/Alarm Clock in main bedrooms Fully equipped, spacious kitchen 2 Bedrooms with en-suite bathrooms and mosquito nets. 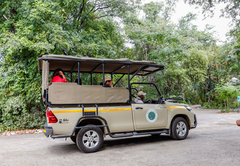 Response timeSefapane Lodge & Safaris typically responds to requests in 5-10 minutes. Child policyChildren 3 years or older are welcome.